Biblical authors were artists of language who created their meaning through their verbal artistry, their rhetoric. These twelve essays see meaning as ultimately inseparable from art and seek to understand the biblical literature with sensitivity to the writer's craft. Contents: David Clines, The Arguments of Job's Friends. George Coats, A Moses Legend in Numbers 12. Charles Davis, The Literary Structure of Luke 1-2. Cheryl Exum, A Literary Approach to Isaiah 28. David Gunn, Plot, Character and Theology in Exodus 1-14. Alan Hauser, Intimacy and Alienation in Genesis 2-3. Charles Isbell, Story Lines and Key Words in Exodus 1-2. Martin Kessler, Methodology for Rhetorical Criticism. John Kselman, A Rhetorical Study of Psalm 22. Kenneth Kuntz, Rhetorical Criticism and Isaiah 51.1-16. Ann Vater, Form and Rhetorical Criticism in Exodus 7-11. Edwin Webster, Pattern in the Fourth Gospel. 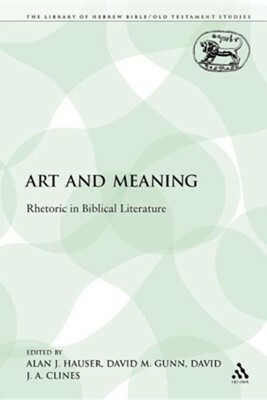 I'm the author/artist and I want to review Art and Meaning: Rhetoric in Biblical Literature.